Here are the best food and meal deals for Valentine’s Day 2019. FREE COOKIE: Customers without a significant other can get a free cookie with the purchase of a meal on Thursday. FREE PRETZELS: Buy one heart-shaped pretzel, get one free with this coupon from Auntie Anne’s. FREE WINGS: 10 free boneless wings with the purchase of 10 wings at Hooter’s when you destroy a photo of an ex-partner in restaurants or online. Carrabba’s Italian Grill: special meals for two starting at $45. Chili’s: $5 Grand Romance margaritas. 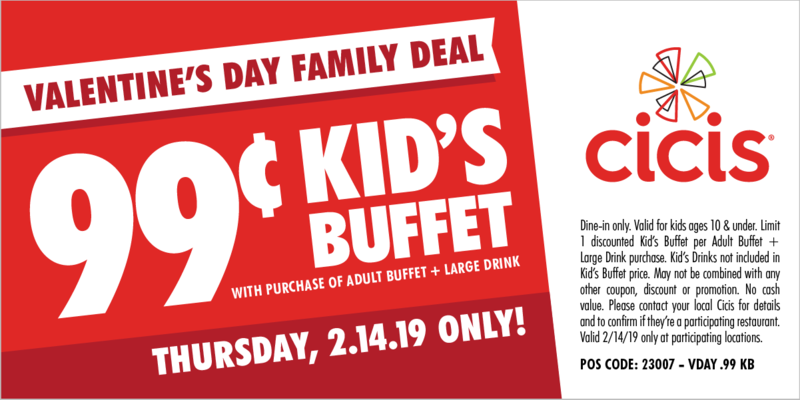 Cici’s Pizza: 99 cents kid’s buffet. Valid Thursday only. Dunkin’ Donuts: Dunkintines can be bought in store while supplies last. Maggiano’s Little Italy: $80 meal for two, includes two entrees and beverages as well as an appetizer and dessert. Max & Erma’s: $29 Cupid’s special, includes two entrees, two appetizers and a dessert. Mrs. Field’s: 30 percent off last-minute gifts. Romano’s Macaroni Grill: $45 three-course prix fixe menu for two. Papa John’s: $11 heart-shaped pizza ad well as an $80 pizza lover’s deal, includes five large one-topping pizzas plus three bread sides and three desserts plus a heart-shaped one-topping pizza. Serves 10-15.